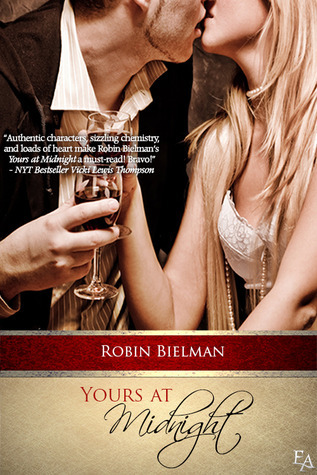 Today I have the pleasure of welcoming to Ex Libris a recently discovered, new favourite author of mine, the lovely Robin Bielman, whose latest release Yours at Midnight, a New Year's Eve romance enchanted me so much I gave it 5 shiny stars! Robin stops by to tell us about the main ingredients of a great romance, and if you tell us what you enjoy in these stories you could win a great book! Please give a warm werlcome to Robin! Hello! Thank you for having me as a guest today, Stella. I’m so happy to be here! *Copious amounts of sexual tension. All the stolen glances, the touches, the flirting, the wondering, the day and night dreams, the conflicts, the almost-kiss, the pounding of hearts, all make me want to keep turning/sliding the pages faster than I can read sometimes. *An irresistible hero. Oh, there are so many facets to making a guy irresistible. Of course hotness is one factor. But there’s got to be more. Much more. Intelligence is a big turn on. Humor. A possessive streak that makes him act like an SOB and willing to do anything for the heroine. Mistakes. There is no such thing as a perfect person. Flaws = Attraction on a whole other level. *Crisis. I love reading about two people who have to overcome obstacles that seem impossible. Love when they get to that point of no return. Love when decisions have to be made and they’re not always the right ones, and how that leaves the hero and heroine vulnerable and confused and someone I can root for. *A dash of magic. Depending on the genre I’m reading it could have to do with the supernatural or it could simply be what makes the characters leap off the page. I love when it’s subtle, when it’s just that little something captivating that makes it so I can’t get the story and characters out of my head. I hope I succeeded in some, if not all, of these ingredients for my newest release, Yours at Midnight. And now it’s your turn. I’d love to know what keeps you turning the pages. Leave me a comment and you’ll be entered to win a digital copy of my debut release, Worth the Risk. Robin lives in Southern California, a bike ride away from the ocean if she’s feeling really adventurous, with her high school sweetheart husband, two sons, and a very cute mini labradoodle named Harry (after Harry Dresden from Jim Butcher’s Dresden Files books). When Robin’s not reading or writing her next story, she loves to bake, run, hike, and dream of all the travel adventures she hopes to have. She is addicted to cafe mochas, and if every day were Cupcake Day, she’d be a happy camper. 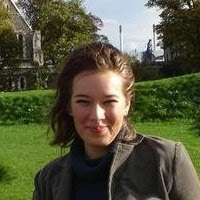 She writes contemporary romance for Entangled Publishing. Lyric Whetsone only had eyes for Quinn Sobel’s brother Oliver, until a car crash took Oliver’s life on New Year’s Eve. Then, a moment of shared grief between Quinn and Lyric became something more impassioned, something that frightened Quinn so much he ran from Lyric’s bed and her life, disappearing for four long years. Now Quinn’s back for another New Year’s Eve, struggling for closure, desperate to leave his grief in the past and make amends with the girl of his dreams. But Lyric has a secret–one that could drive Quinn from her life forever. Will Quinn run away from the love and acceptance he’s always wanted…or will he claim his New Year’s kiss and make her his at midnight? Robin has generously offered an ebook copy of her previous contemporary romance novel Worth the Risk to a lucky commenter! To be entered just leave a comment for Robin and tell us: what keeps you turning the pages? Giveaway is open worldwide and ends on 8 March 2013!